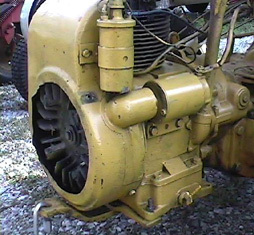 Working daily on a farm, this mobile 150 amp., 100% duty cycle riding welder goes anywhere one can walk --- a most useful (and very frequently used) piece of maintenance equipment. 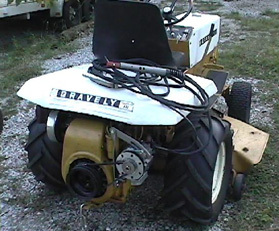 To quote the owner, “I don't know how we ever made do without it” --- “paid for itself in the first month”. This installation is particularly interesting in that it illustrates a number of techniques that are typical to many ZENA welding system installations. 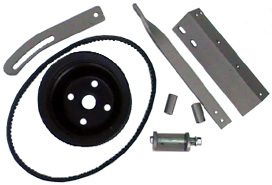 These views show the installation components (including completed mounting bracket assembly). ZENA A300 and A215 Brackets were used. 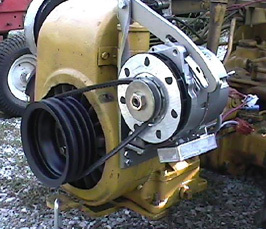 The V-belt is from an auto parts store, the large pulley comes from a Chevrolet dealer, and the other components were fabricated on site using 1”x1/4” bar stock, 2”x1/4” angle stock, and 1/4” wall tubing/pipe (for spacers). Misc. nuts and bolts were also utilized. 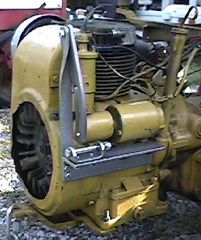 Lawn tractor engine (right side) before installation. bolts which hold starter motor onto engine). 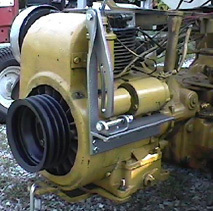 The Power Generator is mounted to the tractor using a simple bracket assembly which is made by using a ZENA A300 universal mounting bracket which is mounted (using 5/16” bolts) to a piece of 2”x1/4” angle stock. 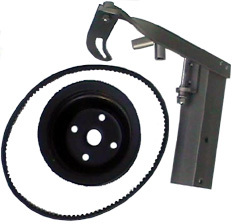 The 2” angle is mounted to the engine via existing bolt holes which are used to mount the engine's starter motor. 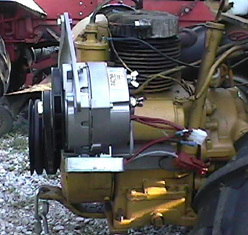 Longer bolts are selected and spacers are used to space the 2” angle away from the engine just enough to clear the starter motor and surrounding components. A tensioning arm is made up from a piece of 1-1/4”x1/4” bar stock (twisted 90° - see photos), and a shortened ZENA A215 slotted tension arm bracket. 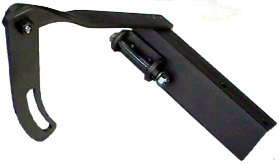 The tensioning arm components are assembled and the arm is attached to the 2” angle using 5/16 bolts. enlarging holes on pulley to match bolt pattern.